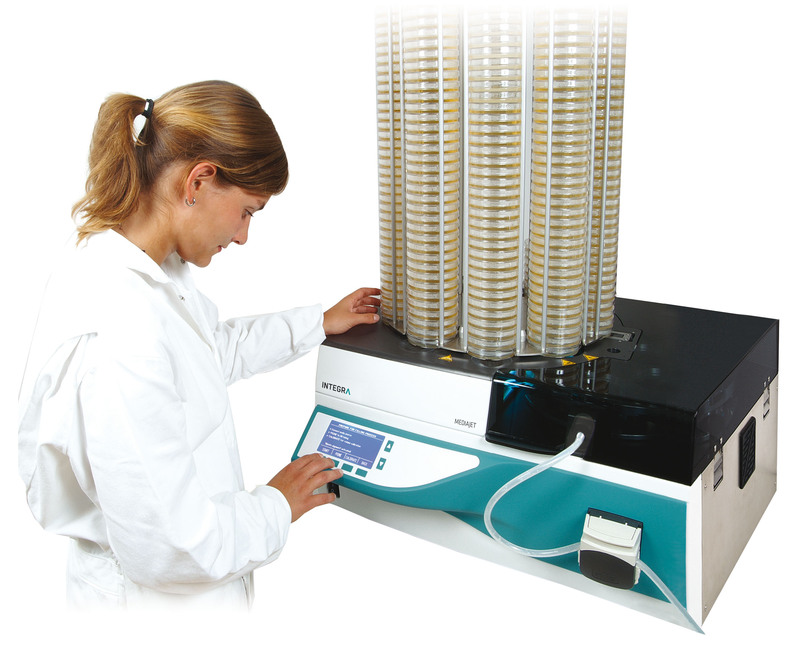 Compact in design - MEDIAJET from INTEGRA offers the unique flexibility to fill Petri dishes of various sizes, Petri dishes with two compartments or test tubes of various diameters and length. The MEDIAJET sets the gold standard for automated preparation of consistent high quality, contamination-free media in Petri dishes and test tubes. The surface of the MEDIAJET filling chamber is manufactured from a single piece of chemically resistant polyethylene, which allows efficient cleaning. In addition, MEDIAJET is equipped with a UV lamp extending over the full length of the rotor where dishes are opened during the filling process. The lamp emits powerful 2.1W UV-C radiation to ensure complete elimination of bacterial activity in the area most vulnerable to contamination. All MEDIAJET systems have a built-in "Agar Spread Function" which ensures homogenous distribution and an even surface on your media. This helps to optimize the media level in Petri dishes resulting in a significant reduction in media costs. Benefiting from INTEGRA's proprietary Feed-In / Stack-Out technology, MEDIAJET operation is highly reliable resulting in unmatched media preparation productivity. Typical production variations in the diameter or shape of Petri dishes are easily handled by the unit, as they are actively guided throughout the entire filling process. The optical dish sensors of MEDIAJET can be easily adjusted to virtually every Petri dish brand at the user interface level. Designed to be quickly productive the intuitive user interface makes it very easy to control all functions of MEDIAJET. The operation of the system is entirely self-explanatory, as all functions and prompts are explained in plain unambiguous language.